Okay, I admit it. During this trip, I've been guilty of playing tourist and have been to some less-than-stellar places to eat due to it. However, I don't make any apologies as it is my trip and really, I can do whatever I want! But it is true that the visit to Carnegie (now closed) yielded predictably sub-par results for far too much money. 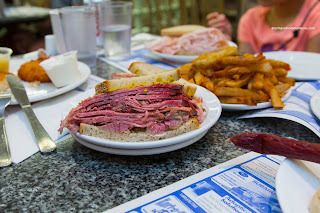 Also, in Montreal, we've been to Dunn's and Schwartz's which are both popular with the tourists. 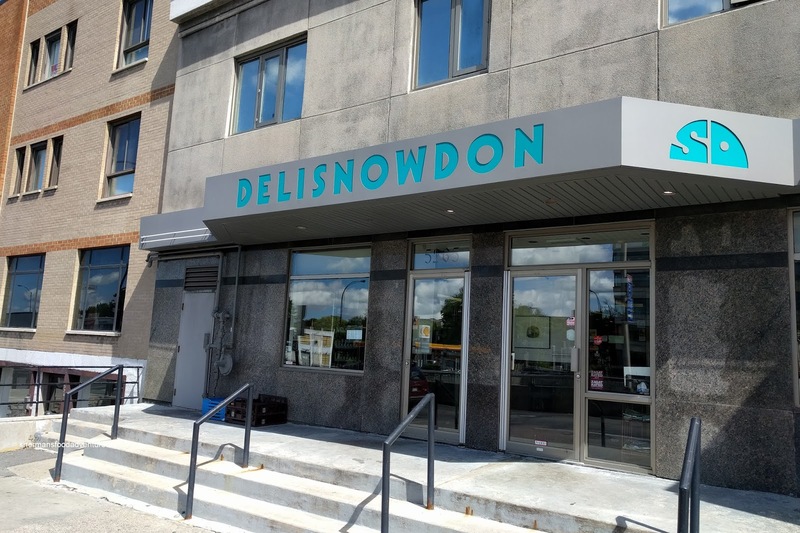 So on our last day before returning home, Viv and I decided to trek all-the-way-out to Snowdon Deli, which is more of a local eatery. Some have argued that it is the place for smoked meat, even better than Schwartz's, Lester's and Rueben's. 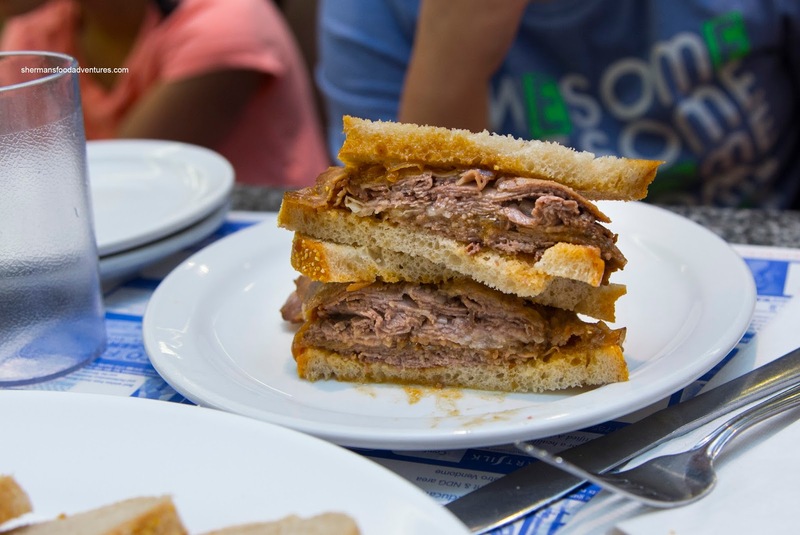 Well, we were going to be the judges of that starting with the hot Smoked Meat Sandwich. I asked for medium and it was tender, fatty and aromatic. I found that it was soft, but still retained a meatiness while being not overly salted or peppery. 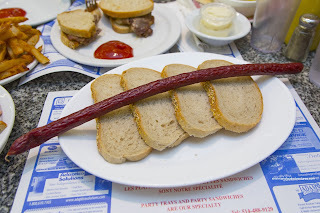 For me, this was better than any smoked meat I've had so far. 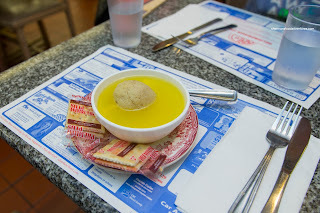 As part of my combo, I also had a bowl of Matzo Ball Soup which was also very good. The chicken soup portion was pretty typical, but I enjoyed how it was not overseasoned where I could taste actual chicken. However, the best part was the matzo ball as it was fluffy and soft with a springiness. It was so good, I had to get another just for my son. Of course he couldn't subsist on soup alone, so he got the Hot Beef Brisket with gravy and a side of fries. Okay, I hate to compare, especially since Carnegie is in NYC and Snowdon is in Montreal (and this one was hot as opposed to cold), but this was far superior. The meat was moist (due to the salty onion gravy) and melt-in-his-mouth tender. He loved every bite, which were few because he completely devoured. The side of fries was absolutely massive where it was practically falling off the plate. These were on point being crispy while still retaining some tender potato texture inside. 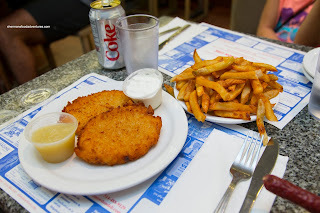 We got an order of Latkas as well which were served with sour cream and apple sauce. As much as I enjoyed the golden brown crispiness of the outside, they were a bit denser than what I generally enjoy. Viv ended up sharing a Smoked Turkey Sandwich with our daughter and although it wasn't the sexiest thing to order, it was solid. The meat was sliced thin being slightly smoky, tender and lightly salty. There was enough of it to achieve balance with the medium-firm rye. I ended up getting one last item with the Full Strip of Karnatzel. 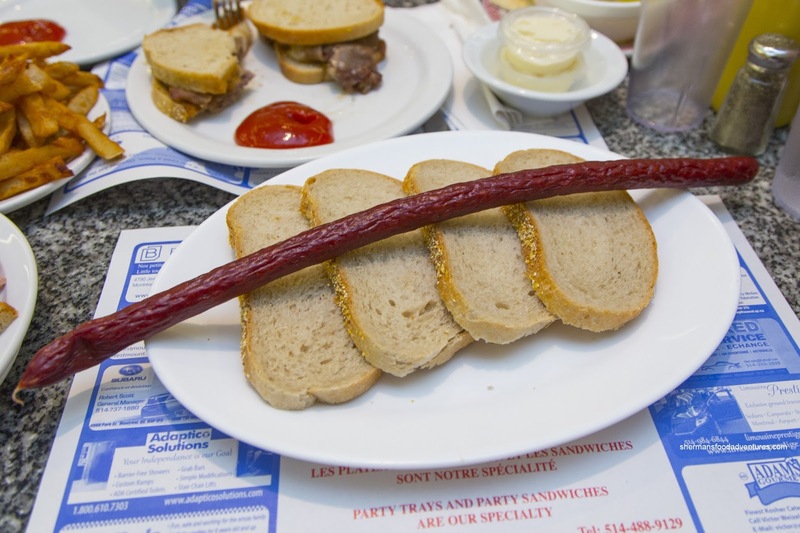 For those who are unfamiliar, this dried beef sausage is as much of a Jewish deli experience as smoked meat. I found this one to be really good with an appealing firmness and packed with enough flavour to warrant the slices of rye. There was a light pepperiness and definite saltiness that was on point. 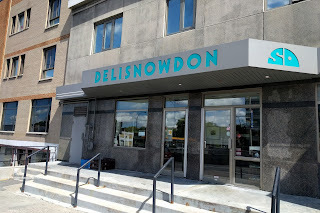 As much as everything food is subjective, for me at least, Snowdon was my best deli experience of the trip by a long shot. Totally worth the trip out there.